Do Millennials have a Lorax? Forbes Magazine recently published the article by contributor T. Scott Gross called Millennials Need a “Think” Button in which he praises his 14-year-old daughter, nicknamed “The Princess”, for being “strong, and independent” and not thoughtlessly following morals, but thinking through ethical questions. I’m not sure this praise for ethical superiority is deserved. I also don’t think Millennials are neccessarily without morals. I think a better explanation for the “post-morality” of Millennials is that the moral code is still in the making. I’m a Millennial as well, and twice the age of his daughter at the age of 28 (does that make me a Queen?) so we’re still pretty young. Millennials have grown up in an era where old moral codes have been reassessed, or thrown out entirely. That doesn’t mean that new morals will not form. In fact, rebuilding institutions, and moral codes is a Civic Generation trait. Dr. Suess brilliantly captures the pitfalls of the last Civic Generation (the GI Generation) in The Lorax. The story shows the downfall of the optimistically arrogant Once-ler. His ethic: the more you produce the better. The GI Generation saw the poverty and starvation of the Great Depression Era, which reinforced the value of prosperity, and material abundance. The Lorax, who was “shortish and oldish and brownish and mossy … with a voice that was sharpish and bossy”, comes along and pours out his seemingly moralistic warnings to the Once-ler. Blinded by his own arrogant optimism, the Once-ler’s “Think Button” repeated the same logic: The more the better. 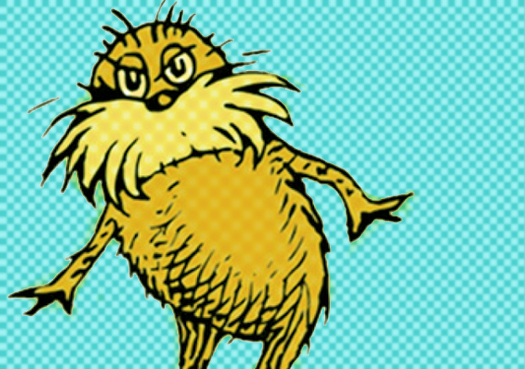 “I’m doing no harm,” he tells the Lorax. The Once-ler’s “Think Button” informed by his “Ethics Button” (and of course blinded by greed) resulted in devastating the landscape. The moralistic preaching of the Lorax did no good. Millennials are the deciders of all things new. We are the the powerhouse of the next few decades. This is heady business that is incredibly exciting. I think Millennials will be responsible for a lot great things, but with such great responsibility we’re bound to make mistakes. The problem is that, if history repeats itself, we will be blind to them. I don’t have a solution for this– I just think that a father praising his very young Millennial daughter for her untested “Think Button” is nice, but premature. 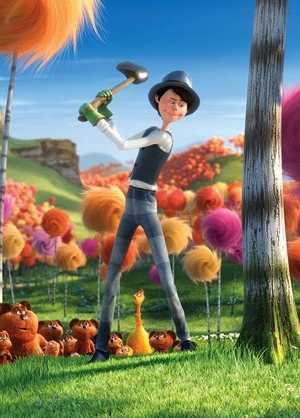 What will the strong warnings from the Lorax be for Millennials? Historically, Civic Generations give birth to a highly-moralistic batch of Idealists. I guess we will leave the voice of the Lorax to our children. Oh, joy– I can hear the cries of indignation already. Any guesses on Millennial blind spots? I’m a Millennial (who also writes about Millennials )and I agree that the moral code is still in the making. The “post-morality” that some might attribute to our generation is a left-over from Generation X’s cultural contribution. That we haven’t fulfilled our promise as a Civic Generation yet, IMO, is due in part to the pervasiveness of Boomer and X projections populating media. I think that anytime Millennials talk about Millennials we grow as a generation, so a sincere thanks for this post! Good point! The more we talk about ourselves, the more we come into our own. I think pragmatism is truly a Millennial trait, so I think some sort of reasonable “code” will be formed eventually. Actually we may end up being too pragmatic as illustrated by the Once-ler. Also, I agree, “post-morality” seems very GenX, I wish Millennials would fess up to this. Just because you have morals doesn’t mean you have your grandmother’s morals. I wrote a post called “GenY Identity Crisis” responding to a Penelope Trunk blog awhile ago. I think she touches on this point. Thanks for the comment. I love Millennial feedback, and it’s amazing the sense of cohesion there has been between different Millennials so far. Great post! What i find interesting is that history really can’t repeat itself. Millennials are not going to be able to ravage the environment, deplete the Earth’s resources and largely dodge the effects. The same goes for social injustice. Globalized instant communication has made our world extremely transparent. This is the challenge of our generation. Right, Millennial blind spots might end up surprising all of our generation. We’re bound to have them, IMO, but it won’t be the blind spots of previous generations, to be sure. I think there could be unprecedented change in the next few decades for good and bad. We’re so focused on solving certain issues, that we may not see the fallout of unforeseen problems. Maybe since we’re “digital natives” global communication could be our downfall somehow. Really, who knows! I’m mostly interested in seeing how Millennials change the world for the good in the near future. Thanks for feedback, I appreciate it! Maybe Millennials become the Lorax. After the Once-ler causes complete devastation, he’s remorseful. He in many ways, embodies the moral voice of the Lorax when he’s sharing his story with the little boy. In the end, he tells the boy how important it is to care about the world and strive to make it better. So it could be (I’m thinking out loud here), that Millenials — as a generation that cannot accept morals at face value and thus has to think through the ethics of every situation — have to have space to experience life on their own, which often can mean making mistakes. But they learn from their mistakes (and perhaps in the process create a new moral code), and can become the moral voice (the Lorax) for themselves and for the next generation.